I think they're beautiful and they remind me of those slivers of agate you can buy. 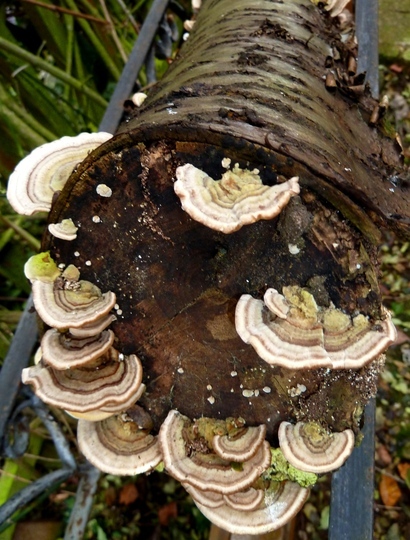 I often look out for fungi when I am walking in the woods. ... more like those, than like marble cake... Lol. they are incredible. looks like one of those pictures you can do spreading the inks out on blotting paper. or dark coloured sea shells. They are amazing aren't they.....could be little flamenco frocks....Lol! Wonderful patterns and colour lol I was going to say the same my sons favourite cake Marble lol. I see how they got the title Turkey Tails ! ... and, yes, Janey ... flamenco frocks ... love that ! and, Sixpence, I'm pleased you can see the "food" theme in this... marble cake, or possibly badly-cooked pancakes ? LOl you should of saved it for pancake day Shrove Tuesday hehe. I might be hungry by then. LOL. assorted accommodation for different insects ...lol. Lovely! Looks like a Cherry tree trunk. This is one of the reasons I have logs and branches on my borders: to provide a habitat for a variety of insect life which in turn feeds the birds! They also look nice and give the border different levels. They certainly do and they are strategically placed so that I can get to the fence and the climbers without having to stand on the plants! I use a lot of silver birch as it shows up well against the dark fence and soil during the winter. have seen quite a few of this type of fungi about Terra. It's been a grand day today after a downpour first thing this morning. I have been down the road and cleaned the church kitchen then Gerry and I have been on a three mile walk around the lanes here this afternoon. It's so nice to have some sunshine, even if it is a bit breezy. The horses in the fields were on their toes and galloping around enjoying themselves. I noticed that all the berries have been eaten in the hedgerows, and that's probably why we have a few more birds about in the garden. I agree with Hywel (Happy New year btw Hywel), I thought of Saturns rings too! ... they seemed to shoot up fast from nowhere ! Lol. Have you sat on the bench yet, Linda ;o) ?? ?